Well slowly but surely we have a new home in Raleigh, NC after moving from Las Vegas. We don’t have any furniture yet as the moving van is taking at count a week longer than promised. I’m not even going to go there on how unbelievably frustrated I am with the moving company. I can’t dwell on it and besides it won’t change a thing even if I do. I’m trying very hard to focus on the positive and ignore the rest as best to my abilities. I’ve learned a few things about moving in the last week that I’d like to share with you. 1. If possible rent a house from the nicest person in the world. Brett and I flew out 3 days before the kids and planned to possibly be in the house for a few days without furniture. We packed an aero bed and sheets thinking we could survive a few days without our stuff. (And we planned to buy new pillows for us since our old pillows were just that, old.) A week later, our house is still empty. Our landlord was nice enough to offer us camping chairs, blankets, pillows, and sleeping bags for the kids so we didn’t have to get a hotel. And some homemade raisin bread for breakfast. Not paying for a hotel is a huge blessing right now! 2. Find a Laundromat near your house. You will not be able to bring enough clothes for the untold duration of your camp out and having clean underwear makes all the difference in the world. My tip to you, check out the machines before you use them, many hold triple loads for $1 more than the regular machine. Washing three loads at once saves you time and money. Really wish I would have done that on my first trip there. 3. If you’re shipping a car or driving, pack that car to the gills wisely. We shipped my car and it got here before the moving van. As luck would have it we packed a few toys, clothes, and kitchen stuff. So I may not have furniture but I am able to cook. Eating a meal together, even on the floor makes us feel at least a little normal. And since I don’t have TV or 99% of their toys, the 3 toys we did pack are saving my sanity right now. Did I mention we are now on day three of rain? I really wish I would have packed more toys and towels! 4. Be nice to your neighbors! You don’t have stuff and you’ll need to borrow tools when the internet guy informs you that a fence is blocking his way to install your lifeline to the world DSL line and you need to take it down before he can come back out. Grrrr, but since you’re nice to your neighbors they were more than happy to lend you tools. They were also more than happy to open the jar of spaghetti sauce even though you swore up and down that you packed the hand crank can opener. 5. Check out the library. We have fronted so much money on this move that we can’t afford to go out and buy tons of new stuff. The library has books and movies for free! You can also take your kids to Storytime which will keep them entertained and give you a chance to talk to another grown up. 6. And along that line. Check out all the local parks and walking trails. We went out today in between the rain just to get out of the house and run some energy out. The kids loved exploring a new park and had a great time looking at all the bugs on the walking trail. My little desert kids are in a whole new world of critters and bugs here in NC. 7. Have a sense of humor. I saved the best for last. There is nothing you can do to get your stuff delivered faster. There is nothing that you can do to stop the rain. Roll with the punches and head to Chick fil-A or McDonalds so the kids can play and you can get some peace. After all, this too shall pass and soon your life will return to normal. Anything I missed from the list? 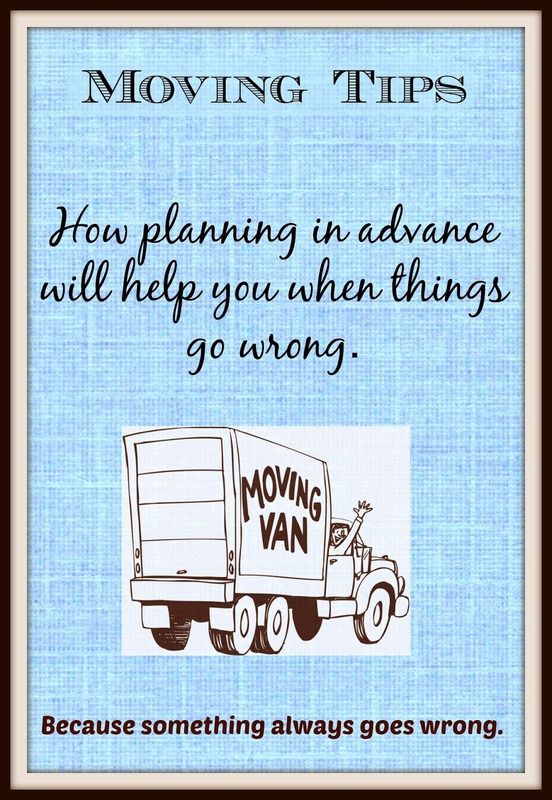 And if you've ever moved did it go smoothly or was it a disaster too? Great tips! I find #7 is pretty much the most important one in life! It really is! Thankfully our moving van finally came so we are no longer camping!